The War Memorial commemorates Australians who died in service or were killed in action during World War One. It is a bronze sculpture of a soldier on a pedestal. A fine bronze statue, by Mr. C. Web Gilbert, has been erected in the entrance hall of the the Victorian Chamber of Manufacturers, and was unveiled yesterday by Mr. H. Brookes, who was president during the war years. It has been erected to the sons of members and to all "sons of Australia" who fought in the war. The Argus (Melbourne), 23 January 1923. This memorial is the work of notable sculptor, Charles Webster (Web) Gilbert (1867 - 1925). Many of Gilbert`s works are war memorials and portrait busts. The Captain Matthew Flinders Memorial in Swanston Street, Melbourne, is one of Gilbert`s more prominent works. In 1921 the Chamber of Manufacturers commissioned Gilbert at a cost of £10,000 to design a memorial to the sons of Australia who fell in the Great War (1914 - 1918 World War). 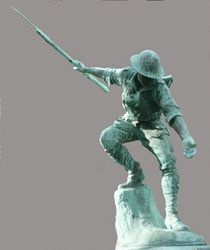 This bronze sculpture of a soldier was originally housed in their building in Flinders Street, Melbourne, but was re-located in 1965 to Industry House at 370 St Kilda Road and, in 1986, to the Australia Chamber of Manufacturers premises at 380 St Kilda Road.